Did you know that Diverse Solutions now offers a Pro version of their popular IDX Plugin? It’s difficult to know where to start when demonstrating the value of dsIDXPress Pro, as there is already so much value in the feature set offered by the basic dsIDXPress Plugin. This easily installed plugin isn’t just an access to an MLS database on another server. A major SEO advantage is that the listing database is actually installed onto your server as a part of your WordPress site. All of those highly relevant keywords, area names, and home characteristic phrases are part of your site to be indexed by the search engines. Unique listing pages for every listing, as well as school information, community directories, IDX listing URLs that include addresses and MLS numbers are going to result in visits from specific address or MLS number searches. Sidebar modules can be configured for specific feature or area searches as well. A “schedule showing” form and contact forms are also included. This is an amazing array of features, and many real estate website owners would be quite happy with them alone. While the basic plugin allows you to create search display results pages, the Pro version also presents the visitor with an advanced search form at the top of each page so that they can further customize their search results. The Pro version also introduces User Registration, a lead generation feature. Visitors must register to receive additional benefits, such as saving listings and setting up email alerts. This will provide you with their contact information for your CRM (Customer Relationship Management) activities. force registration after a predetermined number of searches. register after a set number of property views. preclude certain fields, unless the visitor registers. 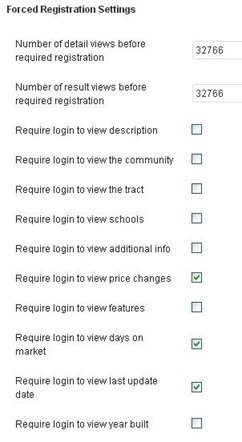 registration required to view schools, price changes, last update date, features, or the year built are other options. There is another feature of dsIDXPro that deserves it’s own paragraph here, as it’s of extreme value for lead generation in today’s mobile world. More people every day are doing their real estate searches on mobile devices, especially when they’re out looking at properties. dsIDXPro includes a full version of dsSearchAgent Mobile IDX. 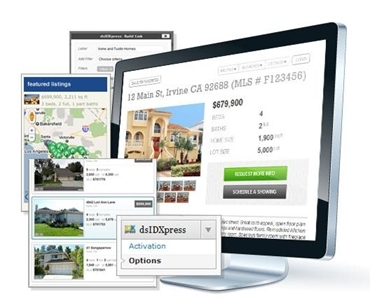 Whether on a smartphone or a tablet, and no matter what size the screen, dsSearchAgent Mobile IDX will display properly and make it easy for the mobile searcher to find properties, and perhaps even find your open house when they’re in the neighborhood! This post has only hit the major highlights of the added features available by moving up to dsIDXPress Pro. Though you can settle for the very comprehensive feature set offered with the basic plugin, why not differentiate yourself, rising above the competition, and offer your site visitors the very best IDX search experience available on your WordPress site? You’ll often find that the difference between a search visitor and a transaction is the fact that they stuck with your site through their research period, becoming your client when they’re ready to buy or sell.